The right-hand side of the graphic in this Demonstration shows a geodesic outside the Schwarzschild radius , while the left-hand side shows the effective radial potential. The latter depends on the value of the angular momentum , which you can vary with the first slider. The effective radial potential also depends on : a particle orbit has , a null geodesic (such as a light-ray) has , and a time-like geodesic has . 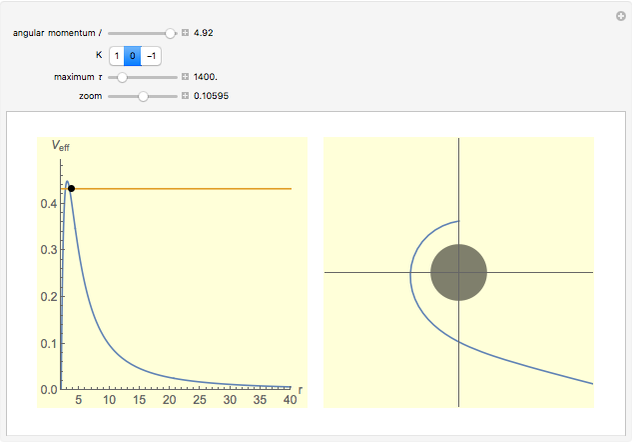 You can specify the starting point of the integration for both energy and radius by clicking on an allowed value, on or above the curve on the left. The two remaining controls, "maximum " and "zoom", specify the length of proper integration time and the zoom scale for the graphic on the right. The right-hand pane in this Demonstration shows a geodesic outside the Schwarzschild radius , assuming a spherical mass distribution or point mass of total mass inside this radius. This would include the case of a black hole. On the left, we show the effective radial potential. As discussed in some detail in standard textbooks (e.g., ), this depends on the value of the angular momentum . It also depends on whether we are looking at a particle orbit ( ), a null geodesic (say, a light-ray, ) or a time-like geodesic ( ). The snapshots show a couple of interesting cases. The first one shows a "plunge orbit", in which a particle falls into the singularity at the origin; the second shows a precessing bound-state orbit, notably different from the classical Keplerian case. The third shows that near the maximum of the potential, light evolves into an almost bound state orbit (there is an unstable bound state at the top). The final picture shows a time-like geodesic, which closely resembles the behavior of a light ray. 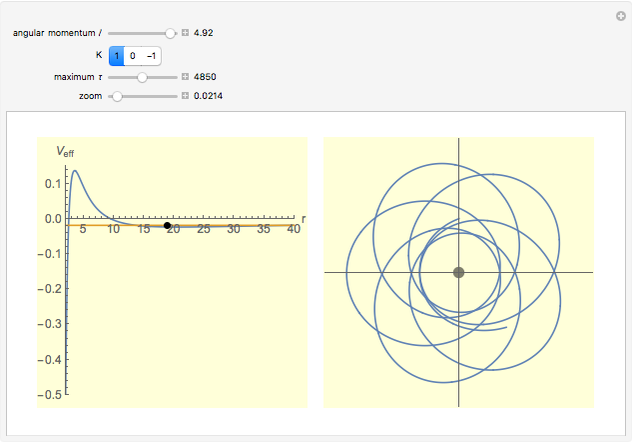 This work was influenced by David Saroff's Demonstration on black-hole orbits . J. B. Hartle, Gravity: An Introduction to Einstein's General Relativity, San Francisco, CA: Addison-Wesley, 2003. D. Saroff. 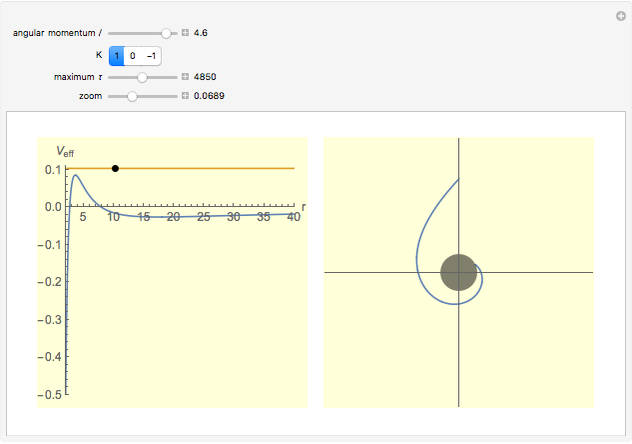 "Orbits around Schwarzschild Black Holes" from the Wolfram Demonstrations Project—A Wolfram Web Resource. www.demonstrations.wolfram.com/OrbitsAroundSchwarzschildBlackHoles. Niels Walet "Geodesics in Schwarzschild Space"